One of the more entertaining parts of our time on the beach was watching Geoff endlessly chasing crabs trying to corner one to get a photo. They move fast! Sometimes a narrow wooden fishing boat, maybe 10-15 metres long, would chug across the bay beyond the waves. It could have up to a dozen guys on, all standing up precariously, none doing any obvious fishing. The next bay along, sheltered at one end, had more boats and a young lad with a net, fishing off what looked like a large piece of blue plastic. 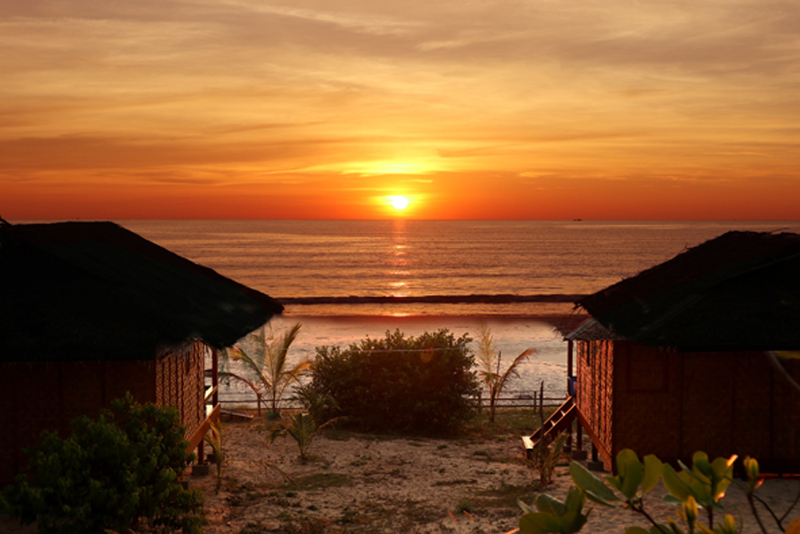 At night you could see the lights of thirty or so Thai fishing boats out at sea. The Thai companies do lucrative (for both sides) deals with the Burmese government for fishing rights, leaving the local fishermen, with their tiny boats and no way of fishing at night, in serious danger of losing their livelihoods. Closer to shore, the one-bedroom bungalows at the guesthouse, with their bamboo-woven walls and thatched roofs (all made locally), were basic but comfortable, with enough electricity to charge your computer, and a bathroom with running water. There was a deck to sit out and admire the view. The food was delicious. The second afternoon a monk came and conducted prayers with a dozen or so women from the village who materialised in the restaurant. There was great excitement as it was the first time a monk had come to the beach. 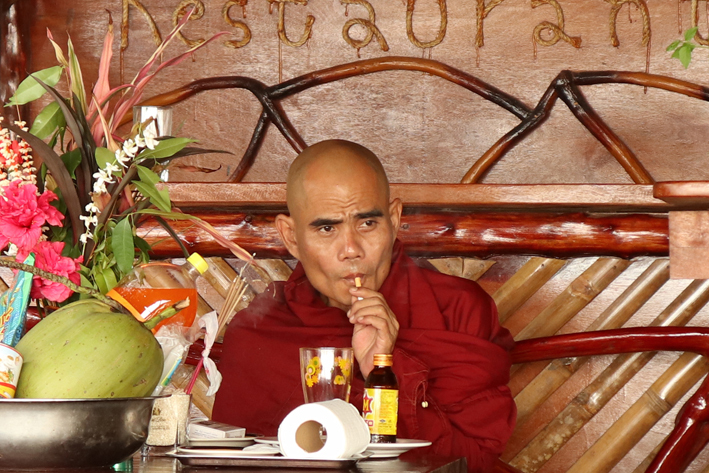 There were offerings and chanting and a bottle of energy drink and a toilet roll... And then the monk lit up a cigarette, which was slightly surprising, as I thought Buddhism frowned on smoking. Lots of village children accompanied their mums and played on the beach, but didn't go near the water. Did I like it here? asked a young trendy-looking Burmese student, visiting the beach for the first time with a group of friends from Dawei. His voice had a touch of incredulity. He was studying English at university and had wandered over to where I was sitting to have a chat and practise his language skills. I liked it a lot, I said. It was peaceful and beautiful. But there is only one shop, he said, pointing to the restaurant. And I can't drink beer there. (The guesthouse hasn't been able to get an alcohol licence either, although there are a few beers hidden up on ice in the jungle for thirsty foreigners.) The student and his friends were heading off to find somewhere more congenial, he said. It is hard to imagine that anyone would not find this place amazing, but I suppose it's all about expectations. Peter confirmed it's hard to get staff prepared to live at his strip of paradise, which they see as the back of beyond. (There's no internet, for a start.) While foreigners begged to stay and work for board and lodging (utterly illegal), he had to pay above market rates to tempt locals. The fabulous chef was only prepared to stay, he said, because after four years of trying for a baby while working in various cities in Thailand and Myanmar, his wife had got pregnant within days of arriving at the beach. Some people in the nearest village (about 15 minutes away), Peter said, particularly older people, had never even visited the beach. They couldn't see the point. Still, that distaste has the huge advantage for spoilt westerners of keeping the beach in relatively pristine condition - apart from areas where tides and storms have deposited the ubiquitous jandals (flip-flops) and plastic bottles. The Burmese, like the Cubans and to a lesser extent the Greeks, have a lively disregard for protecting their environment. So much so that in 2016, a fire fuelled by the huge amount of rubbish dumped at the lively local beach haunt of Maung Magan, destroyed 16 beachside restaurants and cafes. Sixteen. Long may the isolation last here, though I'm not that optimistic.